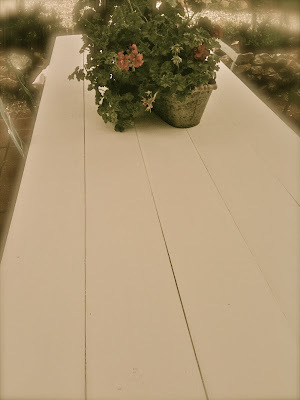 A sweet old farmhouse table waits. around it's old chippy tabletop. 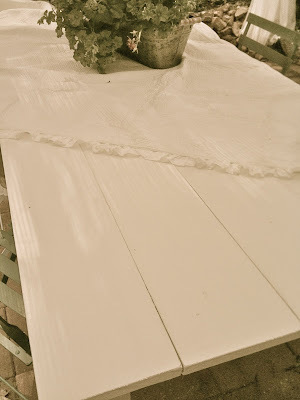 I love old antique rustic farmhouse tables. With layered wood plank tops they have so much charm. Love their shabby antique patina and their wonderful imperfect character. and the boys and I got to work. a layered french gray & white painted finish. but it's so charming already. are perfect with the white. I edited my photos by using an antique variation as well as fading the colors. It is GORGEOUS! I'd love this on my patio! Can't wait for the tutorial. Where did u find the bistro chairs? What a beautiful Mother's Day present-love it! Great table, Courtney and even better that it was made by your family. What a great job they did! It's the perfect Mothers Day gift, and it looks fabulous with the bistro chairs. Courtney, it's beautiful! How very sweet that your boys made it too. 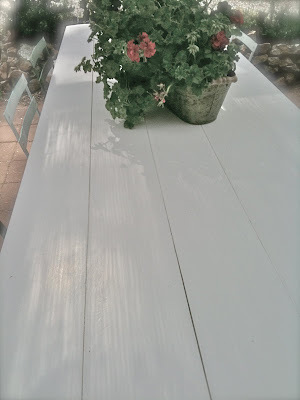 I bought an old farmhouse table last summer, still not shown it in my posts as it's sitting on my patio waiting for the perfect spot. I just love yours and the softness of the white. 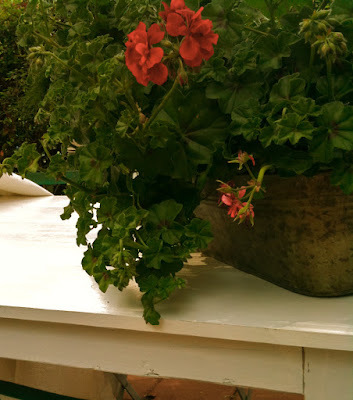 Your Bistro chairs are just wonderful with it too. Great job! Just beautiful! Love the chairs too! Your table and porch are looking beautiful!!! OMG - OMG - OMG! I love it Courtney...did you really build it??? Please share the tutorial with us - step by step? It's been a dream of mine to own a farmhouse table. I love love love what you've done. How sweet Courtney! Lots of memories to be made there. What an outstanding job and wonderful gift. So sweet that they made it for you. So pretty! You are one lucky mama. Can't wait to see it finished! A gift you will treasure forever! Oh my gosh....it is stunning!! LoVe it,lucky you!!! Cullan is hired!!! I adore the white pots! It is so fabulous - what a wonderful gift! The little Kmart chairs look perfect with it too. Well done! I hope you get a chance to stop by this week for our Summer Pillow Giveaway (up to $200 value). What a great gift...it is beautiful! What a great table! And what a great gift! Nice job by your family. I'm sure you'll enjoy it for many years to come. 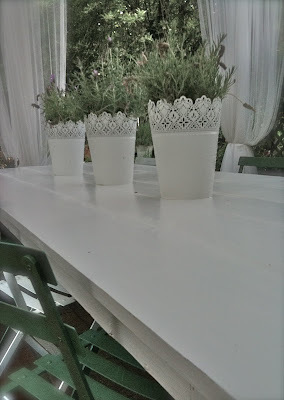 This is a beautiful idea for a great big outside table! Love how you've dressed it up already! LOve your table, your boys did an awesome job! I'd definitely hire them if ya'll live close! Hi Courtney! Love that table!! So nice to meet you....thank you for stopping by. I can tell that I need to spend some time her looking around....how lucky you are with that table!! 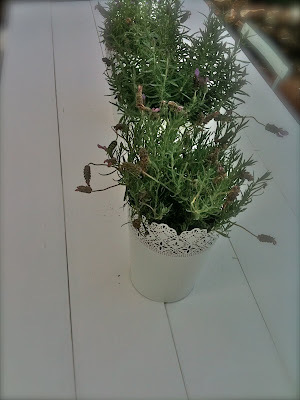 How lovely...the table, the chairs, and the lavendar. A beautiful picture. I'd hire him in a New York minute, Courtney! What an amazing piece of work!! It is just perfect with your little Frenchy chairs, too. :) LUV!!!!! Beautiful table! Wow! Thanks for your invite for Thursday...I'll be there :) Following too. Wow, what a lovely table and such a sweet story to go with it! I can see it will get lots of use this summer. OH MY! is it ok to say I'm a little bit jealous. How fabulous that it was made for you by someone you love. Makes an already great table even more fabulous! Oh what smart boys you have. What a sweet gift and nice addition for your lovely backyard. I may forward this to my son! It's gorgeous, Courtney. I love it. And it's just your style too! And I love furniture that has meaning behind it like this - I bet you smile everytime you sit down! What a fabulous gift to receive! I'm sure you will get years of use and have many memories made around this wonderful table. Your table is absolutely gorgeous. Wish I had one like that. Thanks for sharing at my Swing into Spring party. This is beautiful and your pictures are gorgeous! Talk about a fantastic Mother's day gift! I love it. M.
Visiting from Savvy Southern Style linky. Courtney, it's SO beautiful!!! what a lovely gift and what a gorgeous table. Absolutely exactly my style - I hope the two of you will be very happy together!! That is a wonderful table! Perfect for the patio. Now to eat alfresco, you just have to carry out the dishes. Thanks for linking it up! How beautiful and the love that was put into making it!! awww, this is sooo sweet. I love that they made it for you...better, even, than a vintage one. I am loving your table. I love to be able to make things. Or at least ask Hubby to whip something up! That is such a beautiful table. You'll probably think about how much love went into it each time you use it. I just wanted to pop back over and thank you for sharing your post at Photo Feature Friday! It's beautiful and it was made with love. It doesn't get any better than that! Fabulous! The table looks perfect for an outside dinner. Enjoy. Hi Courtney, What a wonderful Mothers Day gift! The table turned out beautiful and is perfect with your bistro chairs. Thank you for joining my party and I hope you have a fun Memorial Day. Hi Courtney! I just wanted to pop back over and let you know that ths post is goig to be featured on this week's TTF. I just love this table! You did a beautiful job. I love it! Thanks for linking it at my link party too!